Formerly W & W Architectural Metals, Inc.
W & W Structural, Inc. is a full service Structural Steel, Miscellaneous iron and Architectural/Ornamental Iron fabrication and erection firm. W & W Structural, Inc. adheres to a set of core values that form the basis of all our activities, which include: integrity, honesty, reliability, teamwork and respect. 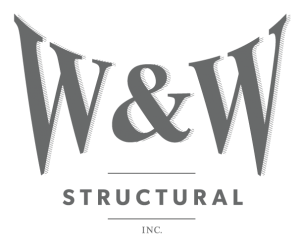 Why choose W & W Structural, Inc.? Solutions and timely schedules for tough jobs are our specialties! W & W Structural, Inc., offers value-added engineering to effectively lower your total job costs. Suggesting design solutions for dramatic architectural appeal will have positive communication reliance with architects, engineers, builders and owners. Solution and short schedules for tough jobs are our specialty. W & W commits itself to exceptional workmanship and places the same high standards on any firm that we subcontract or affiliate with. W & W Structural, Inc. works with companies who are AISC, LA, and Clark County certified. As a policy, W & W only purchases steel from suppliers who are accountable and provide mill certification sheets. From start to finish W & W Structural, Inc. will work diligently to not only build your structures, but your trust, confidence and a strong business relationship. We have a multi-skilled workforce with extensive construction expertise. Our labor force consists of skilled craftspeople supported by a seasoned team of estimators, project managers, detailers, and project coordinators. We have the manpower and the resources to meet your schedule and needs. W & W Structural, Inc. is committed to extending industry leadership by providing training opportunities that foster the professional growth and creativity of our employees. W & W Structural, Inc.’s employees receive ongoing training that enables them to perform their jobs more effectively. By continuing to invest in our people, W & W Structural, Inc. maintains a stable, skilled, and productive workforce. ©2014 W & W Structural Inc. All Rights Reserved.